Naval combat wargames that are not historicals or space games are tricky to find; this is perhaps because the nature of naval warfare is not immediately interesting in game terms. Ships are slow, hard to manoeuvre and armed with more weapons than most games can simulate, most of which shoot things from ranges far beyond what tabletops allow. 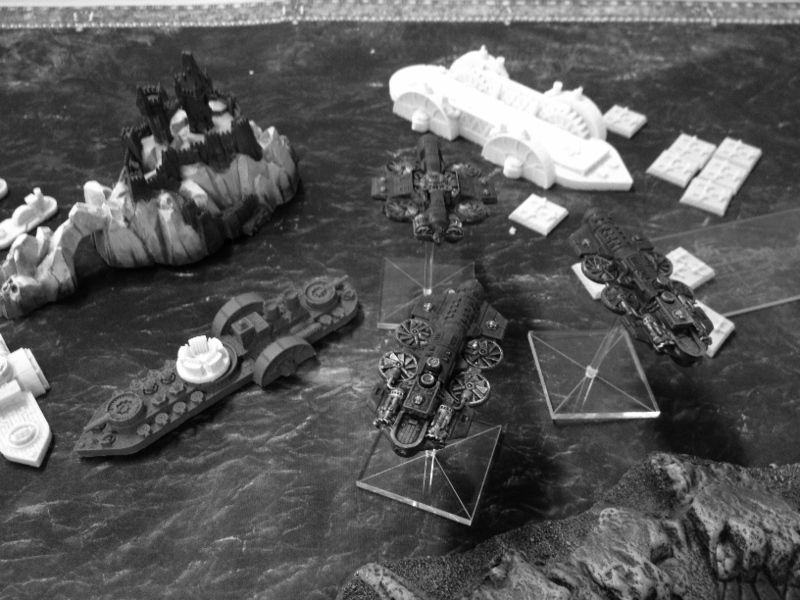 Games Workshop's Battlefleet Gothic, a broadsides-and-cannons game at its heart with a space flavour added, used a kind of non-scale; ship models were huge but simply a flavourful abstraction with only the base of the model actually representing its position. This was a theoretically good compromise but one which made moving models around terrain difficult at times. 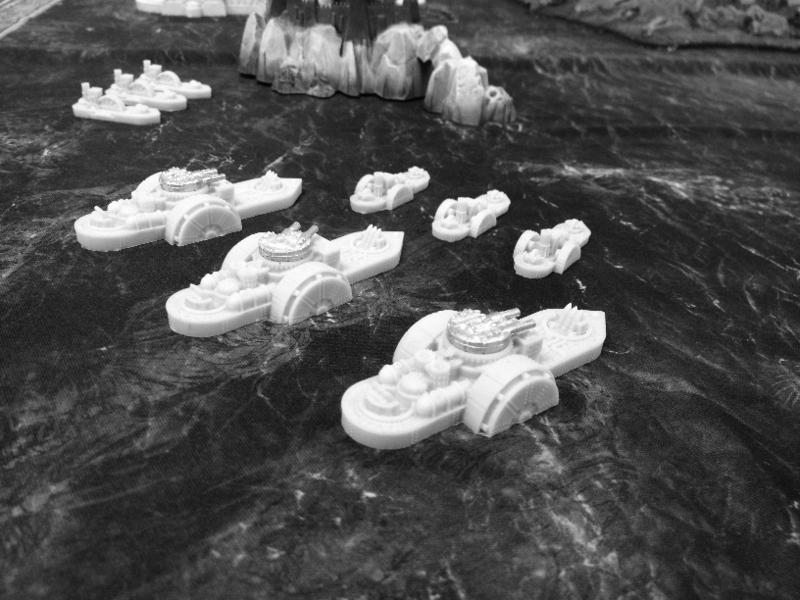 By contrast, Spartan Games have looked to the Epic 40,000 style of mass combat game to scale and design their own multi-theatre war game, Dystopian Wars. 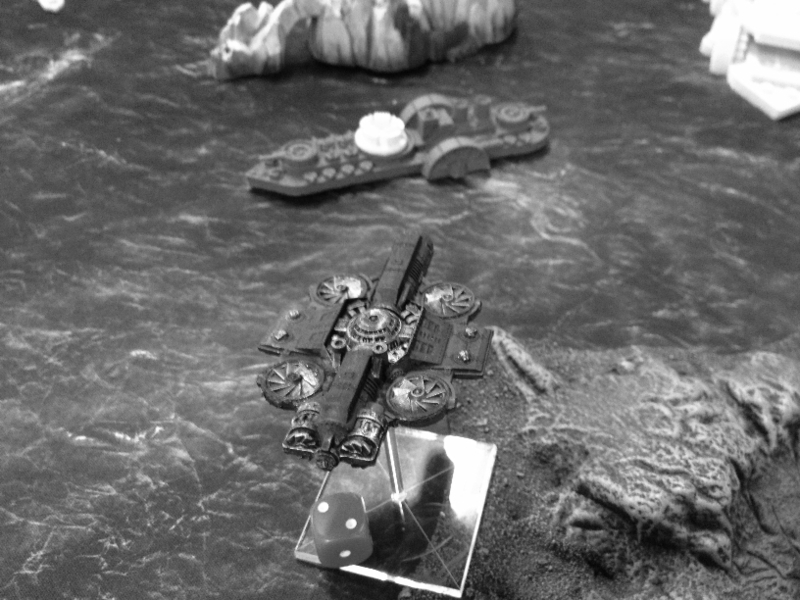 Mechanically similar to its stablemates Firestorm Armada and Uncharted Seas, it is the most developed title with rules for aircraft and land units. If anything, this is a major part of the game's appeal - the same rules allow a battle with aerial assaults, tank columns tearing it up and a battleship offshore laying fire down. It feels like a big war is going on. This is possible due to a high level of abstraction - factions broadly use the same weapons and ship classes and everything boils down to Attack Dice versus static target numbers. 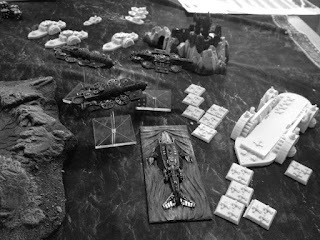 The best way to explain Dystopian Wars is by running through a game in which most of its rules came into play. This is a narrative write up of a 1,000 point game I played recently. To get a sense of scale, a starter box for the game contains a 750 point force or thereabouts. 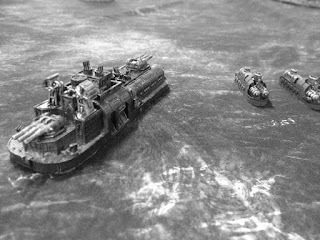 Dystopian Wars is a slow game - a game of 1,500 points or more may well take 3-4 hours to play - so 750-1,250 points is probably the best size of game to play. Force composition is straightforward - players pick a branch of the armed forces to be their "core" (Air, Sea or Land) and must take a Small, Medium and Large choice from it before adding picks from other branches. Each size category also has a percentage cap - Medium ships can be more numerous than Large or Small - but this is not strictly enforced in casual games. The rule book offers helpful advice about how stringent players need be with force composition rules, with fun mostly winning out. Since my core force was naval I had to take a sea vessel of each size class - the battleship, cruiser squadron and frigates. I then supplemented it with air units in the form of a Gyro unit (giant helicopter cruisers) and a War Gyro (sky battleship). Most factions have similar sea units - a Carrier, Dreadnought and Battleship for Larges, Cruisers and Gunships for Medium and Frigates, Corvettes, Destroyers and Escorts for Small. Air units follow a similar pattern - Sky Fortresses (flying carriers), some kind of flying battleship, a flying cruiser and then a strategic bomber and lighter airship. Slightly confusingly carrier planes are not treated as air units; the actual Air arm units are all orders of magnitude bigger. Here it is worth bringing up possibly my biggest complaint with the game - one which also affects other similar games I've played. The abstraction and standardisation has led to a very cautious type of balance where often the unique abilities of a faction are rarely that useful. For example the special weapon types - Tesla Coils and Energy Turrets - are simply put weaker than regular gunnery despite being cooler. This avoids situations like Necrons in BFG - where a faction breaks the entire game over its knee in a sea of exceptions - but does represent a major strike against it. Spartan have shown signs of addressing this but at the moment there are some evident balance issues that require building lists in knowledge of. That said in casual play these will not be immediately apparent, and even sub-par units will find their niche. To return to the game, the mechanics are remarkably straightforward for the most part. While the rule book is somewhat arcanely laid out and hard to navigate, there are various fan-made quick references that address this. Dystopian Wars works on an alternate activation mechanic - each player picks and resolves a unit's actions in turn until they have none left. An activation comprises movement and shooting, and then boarding if possible. Movement is simple; ships have a compulsory move and then may turn or continue moving, turning using a curved template appropriate to their size. Large ships thus have much less steering capacity. 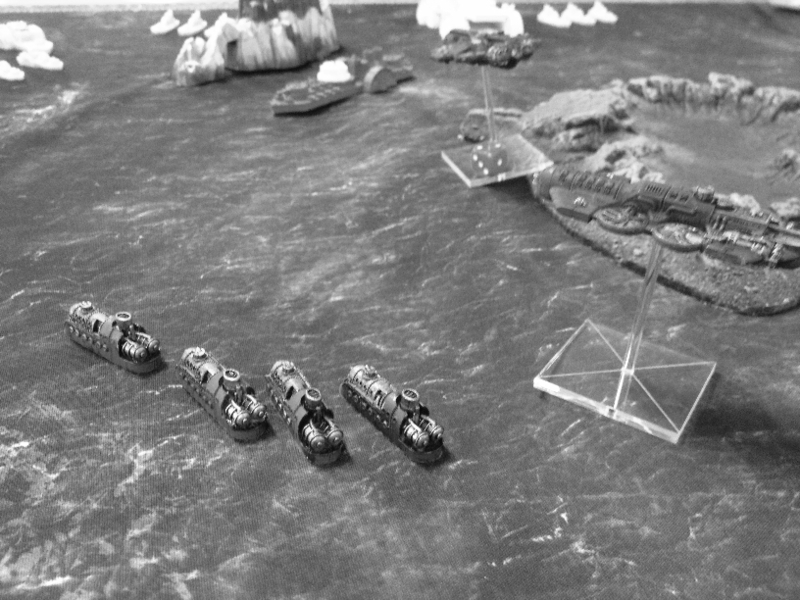 Collisions - as shown in the battle report - are punishing and avoiding them is very difficult if a player is not attentive to ship speeds. The end result is a game which has an enjoyable puzzle element to it in comparison to those with abstracted line of sight or facing - if each model has a known speed and turn arc, as well as known weapon arcs, then positioning is far more important than in a game with freer movement and shooting. This is complicated by the fact friendly models block sight lines; a ship might end up preventing its other squadron members from firing. 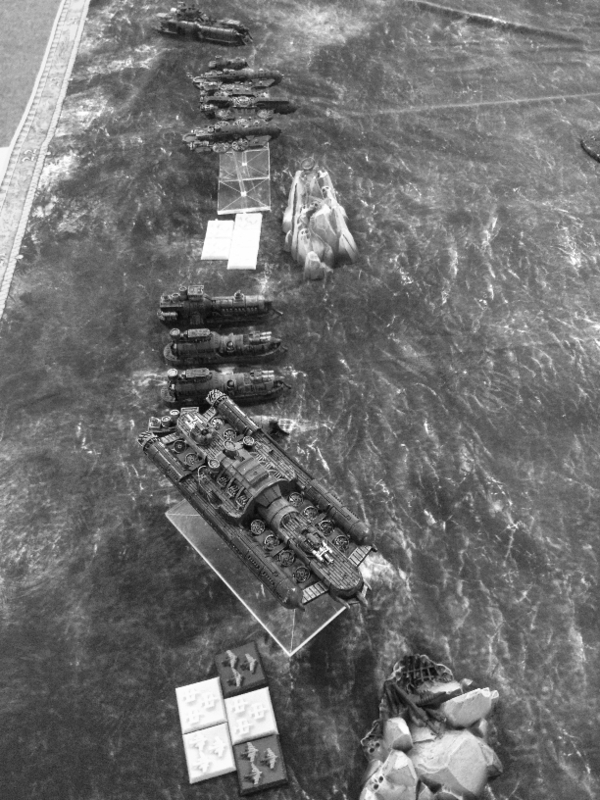 The design space for ships is also large as a result of this; BFG had simple 90 degree arcs while Dystopian Wars takes the shape of vessels and gun mounts into account. For example, a Japanese cruiser has torpedoes fired in a forward channel (a line straight from the front of the ship), fixed port and starboard guns (such secondary armaments are either fixed, limiting their attack zone to a rectangle as long as the ship and extending straight out, or broadside, which have an arc measured from the prow and stern) and 360 degree rocket turrets. By contrast, the American gunboat has a 360 degree gun turret and fixed rockets. Once movement is complete, a ship declares attacks. Each weapon can attack independently, so a ship can engage many targets in a single action or focus its fire. An attack involves measuring range, cross-referencing with a table of values to determine the total Attack Dice, then rolling. A 4+ is usually a hit, and a 6 is 2 hits plus an extra attack dice added to the pool. This is modified by the size of the target (increasing the target number to 5+ or 6) and any obscuring models or terrain (reducing the dice pool). The number of successes are totalled and compared to the target's defensive stats - beating the Damage Rating inflicts one point of damage and beating the Critical Rating inflicts two and a persistent damage effect. Each subsequent multiple of the Critical Rating deals a further two points of damage. Gunnery attacks - the most common kind - use this system. 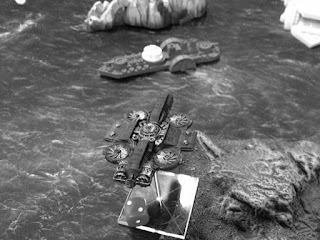 Special weapons like rockets and torpedoes, however, add another degree of complication in the form of defensive fire. After hits are totalled, the defender rolls either AA or Concussion Charges to intercept the projectiles - each success ignores one hit. Since an individual gun may only roll 4-6 dice against a DR of 6 or more, ships may link fire - each weapon beyond the first adding half its dice to the pool. Example: When my Frigates attacked the American airship, they each had a 5-dice and a 3-dice gun. The first ship had a dice pool of 5+(3/2) = 6 dice, then each subsequent ship added 3 (half its individual dice pool) to the total, adding up to 15 dice (6+3+3+3). These AA and AP had to be divided between my three attackers; thus the disadvantage of the defender is obvious. While a defender may call upon its squadron-mates' AA guns to repel boarders, it is stuck with generally a smaller AP score than the combined attackers. Each attacking vessel suffers casualties from AA, and then its remaining AP attack the defender's AP allocated to repelling them. If, after all these attacks are resolved, the defender has no AP remaining, the attacker captures their ship. It takes no further role in the battle but still moves and can cause collisions. Capturing ships - especially if they are flagships, which are worth bonus points - is a quick route to victory, since all missions rely on gaining a certain percentage of the opponent's points total in captured or killed ships. 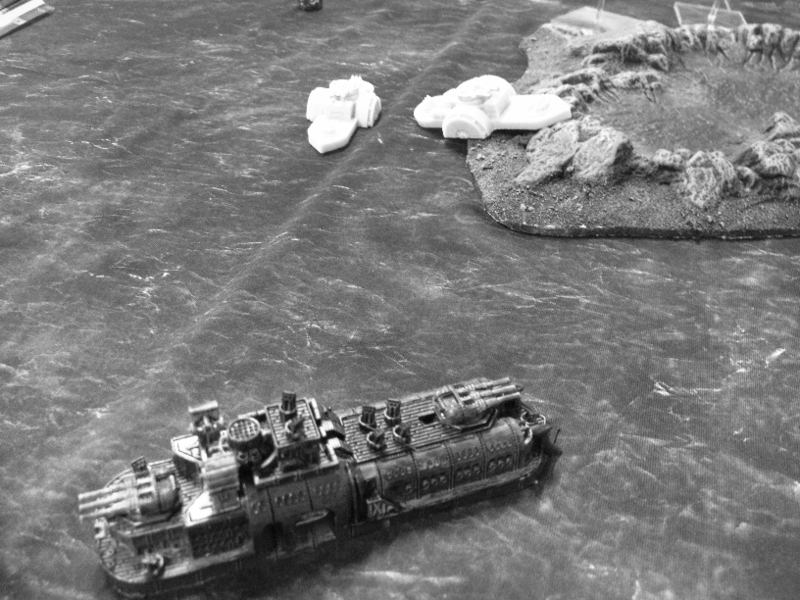 Thus are the essential rules of Dystopian Wars - the real diversity in factions comes from their MARs and Generators, special abilities and rules which either serve as advantages or handicaps. For example, the Shield Generator allows defenders to make a saving throw, or the Sonic Generator makes a special attack roll to reduce enemy AA and AP. MARs range from the powerful, like Ablative Armour which is a single-use defensive boost to handicaps like Conscripted Crew who are weaker in boarding actions. Similarly, the "Tiny Flyer" and "Infantry" tokens add a level of complexity; they function like small ships but are much harder to kill and similarly can slip under enemy shields to deal significant damage. If a bomber wing can make it past the AA of a battleship, it may well inflict a critical hit or two. Overall it is a rewarding game to play - not a perfect one, since its faction balance is still patchy and its rulebook is hard to navigate, but an entertaining one. The miniatures are detailed resin and metal hybrids which are very reasonable (a starter box is around £35 and ships tend to be £6-£12 a pack depending on size) and, perhaps most importantly, it has a welcoming online community on the official site who provide information about factions. Spartan's customer service is exceptional - they fully encourage rumours and spoilers, with an ongoing "what's in testing" feature on their website, full fleet rosters for upcoming factions posted in advance on model launches, and a highly communicative team who resolve rules disputes.